Summary from Goodreads: Everyone in Shaker Heights was talking about it that summer: how Isabelle, the last of the Richardson children, had finally gone around the bend and burned the house down. I read this for my One Book At A Time reading group. I had mixed reactions. According to Goodreads I am in the minority there. I simply do not care enough to write about the plot. I give you the Goodreads summary. I do grant Celeste Ng admiration for her storytelling chops. I could not put the book down and read it in two days. Yet, I felt uneasy as I read, appropriately for the characters, but also for myself because it seemed she might have pulled some cheap tricks bordering on being manipulative with my emotions. After our book club discussion the other night, where I was again in the minority, I decided to let the uneasiness go. There is absolutely nothing wrong with an author providing sustained entertainment for readers and the results are in on this one. It did. I concede. So you felt manipulated, but...Did you like it? You acknowledge that Ng is a good author as you couldn't put the book down, regardless of how you felt about it. For the most part, I don't mind authors pulling that trick, unless it is glaringly obvious. It seems that you think it was the case here. Did you like Everything I Never Told You? I can't remember if you reviewed it, but it was quite popular back when. I have that one on my wishlist. See, that is what was weird. I was caught up in the story but I didn't like the book that much. I felt pretty much the same about Everything I Never Told You. Mixed feelings. Was it the story (plot-wise) or the characters that you didn't like? Or both? I felt she used both the story and the characters in ways that seemed designed to make me think and feel certain ways and I had a problem with that. I've been on the fence about this novel. It's been so popular and the author actually was at a local indie bookstore near me recently. But I wasn't able to see/hear her read and sign copies of her book. 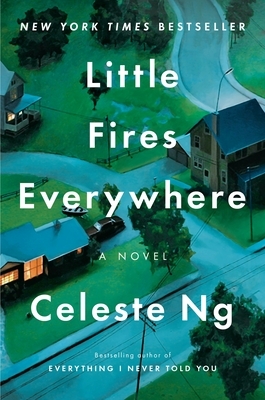 Not sure if I'll be reading LITTLE FIRES EVERYWHERE. I liked your comments :) I did enjoy this one and guess I read less into the authors style than u did. Glad your group enjoyed it. Our book group read her first book and it made for a lively discussion as well. Yes and books that make for lively discussions are the best kind for book groups! I'm sorry the book made you uneasy. I really liked it. Not that I particularly liked the characters, several of whom were presented as manipulative and not really nice people, but, on the whole, I thought the story was absorbing and well written. So, count me in the majority for once! You are officially counted in! It is fine if you and I disagree for once! Glad you liked it so well. I'm trying to remember how I felt about this one. She is a decent storyteller (and I will likely continue to read her) but her characters often drive me a bit batty. I don't like them much. How's that? I looked up your review. You liked it more than I did. These days I have to be in the right frame of mind to read about white people's problems, you know? I did feel for Mia, the photographer/artist and for the Asian mother, but she just didn't convince me.